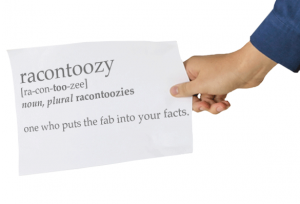 Ra’-con-too’-zy: one who puts the fab into your facts. You’ve heard of the word raconteur – a teller of anecdotes. A good raconteur or raconteuse will keep you enthralled and you’ll remember the story long after you’ve heard it. A racontoozy is a word we made up because, like a good anecdote, it’s memorable. Different. Just like you and your business. As racontoozies, we work with you to bring your personality to your company’s website and marketing materials. Your company is about YOU – you are putting time and effort into running it and making it successful. YOU are the heart of your company, and your personality should be shining through authentically across your brand. Is the story you tell on your website the same story you tell people face to face? Is it as animated, as interesting? Is it a memorable anecdote, or it is very dry and factual? Many entrepreneurs can state the facts about their business very well, but don’t have the marketing and communications training to make their material truly shine and engage prospective customers and clients. 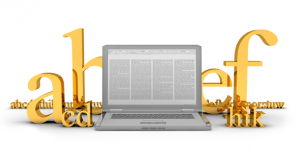 They feel stilted when it comes to telling their story on paper or on a website page. (See an example here) You do need to state truthful facts about your company, but we will ‘put the fab in your facts’ and bring your personality and passion for your business into your website story and other marketing material. Every business owner has a story behind his or her business, and telling it with an authentic voice means readers can identify and empathise with you. This is a different service to simply editing or proofing copy, which is more a matter of consistent style, grammar and punctuation. We interview you and get to know you and your business before we write a single word. We quote each racontoozy job individually as no two companies and people are identical, so do contact us to find out more. Even the best of us need a second pair of eyes to go over important documents from time to time. We offer a proofreading service to help you deliver professional documents, checking and correcting where necessary grammar, punctuation, spelling, sentence and paragraph structure and readability. If you have a preferred style guide which you apply to all your documents, we’ll ensure your document complies with that, too. If English is your second language (ESL), we can help you deliver exciting marketing material and other documents without losing your own identity. Many people know what they want to say in their own language but have difficulty marketing successfully to an English-speaking customer base as their English isn’t as fluent as they’d like – particularly in online and hard copy documents. If that’s you, we’re here to help! We can rewrite your website and other material in perfect English, and it will still retain your character and enthusiasm for what you do. How a Rancontoozy adds fab to your facts. 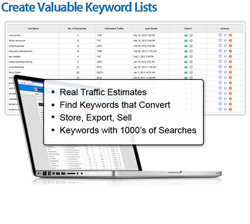 Here’s how a racontoozy can bring your website copy to life. Which of these ‘About Us’ profiles makes you want to meet with the owner of the company? 1. About our Company The Urpnewt Widget Company was founded in Sydney in 1960 by James Urpnewt, primarily to produce custom widgets for the marine industry. Since then the business has expanded to produce Australian-made widgets to fulfil a range of engineering needs – see our products and services page. The company is now run by Jerry Urpnewt, James’ son, and a third generation of Urpnewts has joined the company to keep the family name going on. Contact us here. - or - 2. Three generations of Australian innovation My father James was 25 when he had a brilliant idea for a new device which would help boatbuilders and repairers. While he was working full time as an engineer he developed the Urpnewt Squidgewidget in the family garage, devoting his nights and weekends to creating the Squidgewidgets one by one. Once word got out in the boating industry he couldn’t make them quickly enough. In 1960 Dad successfully applied for a patent – and a lease on premises. The Urpnewt Widget Company was officially up and running. Dad’s workforce grew from one to ten, and by the time I was a teenager I was learning the ropes of the family business and coming up with new widget ideas of my own. Now we proudly employ 25 people in our modern Sydney facility including my son Jack who is, like me, an engineer, and my daughter Joanna, who has a degree in marketing. We design and manufacture innovative custom widgets to solve problems and make lives easier, supplying industries as diverse as catering and beauty, which is about as far from hulls and salt water as you can get. These days we’re exporting our widgets all over the world. Find out more about them on our products page, or drop into our showroom at 345 Billock Street, Billockville to see the quality of our widgets for yourself. We’re three generations of Australian engineers, designing widgets for the world. If you need a widget, you need to talk to us. - Jerry Urpnewt, Managing Director If the second company profile floats your boat (pun intended), you need to chat with our resident racontoozies. We’ll help you tell your company’s story in a compelling, honest, individual way. If the first example is more to your liking, you probably don’t want to work with us. We want to use creativity to present your company and your story to make an individual, unique statement.